The Chilean specialty smells like a flower and tastes less tart than its red relatives. In the Chilean city of Purén, a small group of farmers tends to a pale, aromatic crop on steep hillsides. 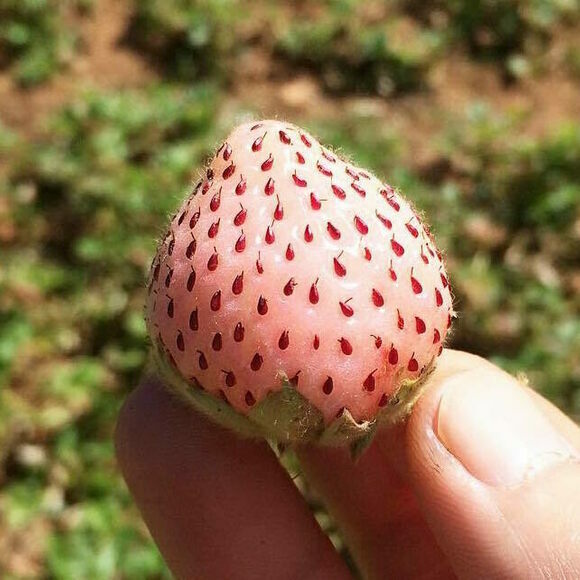 They are growing frutillas blancas, or white strawberries. Historically, these berries were prized for their impressive size, but now their colorless appearance and delicate flavor are their most distinguished traits. The pigment they lack is what gives red strawberries their signature tartness; so Chile’s berries are light on acid and surprisingly floral—almost like eating strawberry perfume. Even though this white berry grows only in Purén, you can find its descendants in nearly every supermarket across the United States and most of Europe. In 18th-century France, a farmer bred the Virginian and Chilean varieties, and voila, the modern garden strawberry was born. Get to Purén during the summer harvest (November to January) and find a local market, where the berries will be sold directly by the small collective of farmers. This dark, rare fruit lasts a very long time. This Borneo specialty tastes like olives, carrots, and brie cheese—if you know how to prepare it. Almost every Newfoundlander has a secret spot for foraging this honey-sweet berry. What look like noodles are actually delicious baby eels. It's darker, saltier, and healthier than white sugar. “To die dreaming” tastes like an orange creamsicle. The signature dish of “the Crazy Woman” and the city of Granada.